Hello there! Since I'm trying to transit to become a parent blogger, I shall start off with my first official post and it shall be about this deadly disease in young children called "Kawasaki"
Please mind that this is a really long post but I hope you take your time to read and learn about the seriousness of Kawasaki. What's Kawasaki disease all about? The most scary thing is that there is no test to diagnose KD. The only possible way to tell is through observation on the various symptom. How it all started with my little boy? 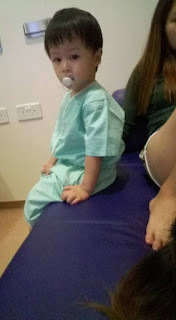 I remember that year was 2015 just close to 1 month after Nathan's 2nd birthday (Nathan is the name of my boy), he started off with fever on and off and it continues for 2 weeks. At that time I did brought him to a few doctors thinking it's just another viral fever since he goes to childcare and it's consider rather common for young children to gets sick often. But I got my lesson learned really quick through this period. After the 2nd week, my family started to noticed some thing isn't right with Nathan as he began to not wanting to eat and he started to have a small swell lymph behind his ear on the right side. (unfortunately I didn't save the photo as I didn't thought that I will write this article) We immediately send him to KKH A&E department. After a long wait of about 2hrs, it's finally our turn. 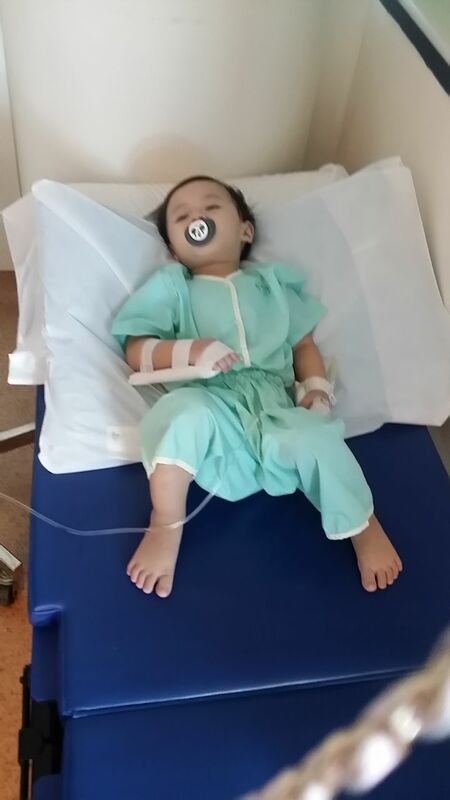 Doctor advised to admit him due to the prolonged fever and also the feared of dehydration as he isn't eating. It was near to midnight, the actual resident doctor only came to checked on my son the next morning at about 8am. Usually for midnight cases they will send standby/trainee doctor to see the case and then report it to the head doctor the next day. Next morning came and the "Prof" came to visit and checked on Nathan's fever. My mum didn't stay around the night before but she has a lot of concerned and wants me to check with the doc but I again was not that "anxious" as compared to my mum. But I followed her instruction and asked the doctor. The doctor actually told us that is nothing serious as it's just another case of swollen gland/lymph node which she has seen in all the young children based on her past experience. Her answer actually assured me and my parents a little. Nathan have to continue to stay in the hospital as he refused to eat or drink and have to be on IVF drip. After the 2nd day we realized that he isn't recovering and that his swollen lymph seems to be getting even bigger and redder. Hence, this time I got worried, the "Prof" came to visit on him as the usual routine again and my mum was around. We checked with her if we can send him on an X-ray but she refused to do so and again repeated her term-logy of "It's just another case of swollen gland/lymph node which I've seen a lot of times" and suggested to prescribe another kind of medication instead. The next day as it was a weekend, there's another doctor that came for the routine checks instead of the "Prof". Seeing that it is a different doctor, we decided to take the chance and asked for different opinion. The doctor actually thinks that Nathan's condition is quite serious and he suggested that he should do an X-ray like we asked. But unfortunately the slot for X-ray are full and have to be scheduled to the earliest available which is next day instead. The 4th day came and it's the day that the actual doctor that is looking after Nathan came back to work and the morning checks, the other following doctor told her that the doctor which seen Nathan yesterday needed an X-ray and she was so furious and say why and said don't have to and so it's cancelled once again. So Nathan is drinking a little as we tried to feed him. But mind this, his fever isn't getting better! By the 6th day, doctor said that we can be discharged. Alright so I thought. We discharged and went home. The next few days it was really a terrible one. Nathan began to show sign of red eye and his feet and finger was all swollen and he started to limb when walking. We was all so panicked. This time my mum ask my uncle to bring him to his regular PD for his daughter at Mouth Elizabeth as we doesn't want to go KKH and wait for a few hrs again. I didn't tag along as I have got work and the job that I was in, my boss was not very happy that I keep taking leave. So my mum and uncle helped me instead. Once they are at the clinic, the PD just see Nathan and immediately ask him to be admitted to KKH again as he is suspected of having Kawasaki Disease. When my mum told me about that I went to googled about it and I almost cried out because of all the negative effects which will cause one to have if they caught that disease. I immediately went to hospital after my work and still waiting for admission. The doctors at A&E admitted us after seeing the letter and Nathan's condition. This time it's also late night too but due to the seriousness of KD, alot of team doctor came and see Nathan and they took alot of blood from him for blood test. The next morning result came back but as mentioned earlier, there is no test to determine the disease, the doctor has to make arrangement for him to go to the cardiologist to have a test and some other test which I totally forgotten what it's called. There was too many things going on at that time and I being a single mom, I have to juggle with my work and Nathan that I actually used up all my leaves and have to take unpaid leave. That month my salary got deducted quite abit :( But nothing matters as long as my little boy is safe right? After all the test was done, the doctor told us is seems to be KD. I was really furious as well as my mum. Because he was admitted right before he got diagnosed of it and the so called "Prof" of KKH didn't even suspect or educate us about KD and just send us home based on her guesses!!! We didn't even complain about her to KKH as I totally don't have the mood to bother about that seeing my son suffering. Also I do not want to name the doctor as this post isn't about shaming her but to bring awareness about the seriousness of fever that can be linked to KD in young children. After the diagnostic, doctor suggested using IVIG as treatment. After the IVIG treatment, I'm told that fever supposed to come down but his fever still comes on and off and that worries the doctor and was told that he needs another different kind of treatment which is steroid. I felt the heartache seeing him get poked by all the needles. The doctor even ran out of veins to jab him and have to find vein at his leg area. His skin was also starting to peel in between his finger nails and foot. I really cried seeing him in pain. He was discharged the 5th day. Echo scans will be scheduled post discharge from hospital between 2 weeks to a month to check on the heart. Depending on the result, the frequency of subsequent scans will be advised by the cardiologist. He also have to take Steroid and Aspirin for continuous of 6 months. Luckily Nathan is one of the lucky few that echo scan was normal and no sign of changes for coronary arteries. Nevertheless, I'm sure to bring him back for an annual Echo as I read many sudden heart attacked in teenage times when the kids grow up and I'm really worry especially now whenever Nathan played a bit too much or excited he will pant and his heart beat extremely fast. In any case now you have some ideas of what Kawasaki is all about, I urged that all parents to not take fever lightly. Also a big thank you to my family for being around me during the most difficult time. If you need support for Kawasaki, I have found and joined a really helpful group in Singapore. Do let me know if you need help or any question. Leave me a comment. Thanks and let's fight the deadly disease together! Oh my god! Didn't know much about this disease. Will be more careful with my kids now. thanks for sharing, Mommy! Thanks dear! Yes be wary. This is a very scary disease. U are very strong mumma...love this blog..
Hopefully Nathan and the rest of the kids will stay strong and grow up healthy. Just curious about what's the temperature range for KD? Thanks for the comment dear. Yes we was all so angry with that Prof. I was just searching through all the memos from the doctor and I actually found the diagnostic from that Prof which makes me even angrier. But thankfully Nathan is a lucky boy and he is well and healthy now. Temperature range actually various but it's usually more than 38 degree for my son's case. Thanks for sharing your experiences, 3 months ago my daughter which was 6yrs old had similar fate. We went to KKH twice for A&E due to persisting high fever and was warded in the 2nd visit after my constant persistence. The various specialists and in house PD including the main doctor claims it's viral prolly and discharge me the following day just to continue tackling fever with paracetamol and ibuprofen. Despite many blood test done there they say nothing is detected. 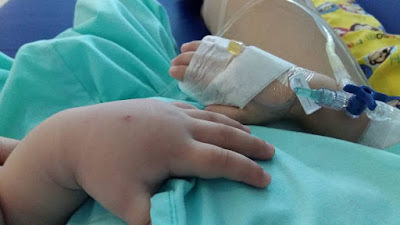 Upon the following day still having constant fever we decided to visit Dr Ang at TMH and immediately after the blood test he detected abnormalities on ESR and C-reactive protein indicators. We were sent straight for ICU IVIG 24hrs treatement w.o hesitation and diagnosed with KD. That entire ordeal and episode saved my daughters life and thankfully 2D echo subsequent scans shows no sign of arteries defects. In my personal opinion, always seek second opinion as there are many autoimmune diseases theses days that might not easily be detected if lack of prior experience and actual diagnostic instruments. Also ensure to have adequate insurance that takes care of hefty hospital bills to safeguard your finance. Sorry to hear that of your daughter. I'm actually wondering why are the PD at private clinics actually better than KKH. Sometimes I think those doctor should actually do a better and detailed checks before big things happen to some kids. Glad there isn't any sign of arteries defects and hope your girl is healthy and well now. Like you say luckily I have bought good insurance for my boy and I'm going to start a post soon about why insurance is so important. Thanks for reading mommy. Thank to all the parents who share. Is a good information to those parents who have not heard abt this disease. My boss is also diagnosed with this Kawasaki disease when he is 3 yr plus. I am fortunate to see a good children doc which suspected it early. My boy is down with 2 day fever and we have bought him to see doc when he say in pain at his neck and we have found lump. After seeing the doc, the doc have called us to go back to the clinic the following day to check again. On the 3rd day, the other side of the lump have also appeared. So we immediately send him to hospital to have blood test and antibiotics. On the 4th day, symptoms of the Kawasaki start to come and the doc we see have confirmed and it. Within the 10 days, my boy have went thru the drips and the medication. Lucky during the 48 hrs monitoring, he recovered. Must thanks to the hospital and the doc that treat him fast. Oh dear sounds so painful for his neck. Almost similar case as my son except for his fever it was near to a month. Hope he is recovering well now. Thanks for sharing your story. My son was diagnosed with kawasaki disease on the 5th April at KKH when i brought him to A&E due to his sky high fever of 40 degrees. Before that when his fever started on 31st March, he has seen GP twice but was diagnosed with viral fever despite him complaining of stomach pain. On the following monday he actually vomited but with some streads of red which I try not to think too much that ot could be blood. Brought him to GP again and was given vomiting medicine but doesn't help. Thought it could be stomach flu and i gave him probiotics supplement which usually works on him. This time round despite high dose of the supplement it still didnt help with his vomit. I decide to bring him to Mt A on tues night as there have shorter waiting time compared to KKH. The doc after seeing him and did a blood test found that his white bood cell count is high. She didn't admit him due to lack of bed in hospital and asked to monitor him at home with the antibiotic. He was also given the fever bullet to subside his fever and this is his first time using it. Following the instruction, i fed him two doses of antibiotic within the next 24hrs but his fever didnt seems to subside and was soaring up to 40 which shocked me. Immediately i brought him to KKH which the doctor immediately see him and saw the unique sign of kawasaki disease, the strawberry tongue. When he told me about it, i almost cried as i read about it before that is serious. My son only went through IVIG on yhe 8th day of fever but unfortunately he has a slight dilation on his right of coronary arteries. Somehow i felt this must come with experience to be able to get the right diagnosis. Moreover symptoms may not surface so early to be detected that is kawasaki disease.Somehow, i m glad the doctor manage to discover the symptoms on my son. Oh no the IVIG treatment came late for your son too. I hope he is recovering well soon. Do remember to bring him for annual Echo scan. Takecare. I'm a Father of 5. I had 2 kids went thru this whole ordeal. My first encounter was when his 9 months my GP was experienced enough to diagnose his symptoms as Kawasaki. My second encounter was 3 months by then we somehow got the experience so we quickly head to A&E. Doing the ivig was a painful experience to go thru. Anyway take care. Wow having to go through KD twice must be so tough for you! I agree that IVIG treatment is really painful experience. It broke my heart to see children having to go through it. Takecare too strong daddy! "Genetic" disease is nothing more than pathogens altering the genes via infection. People pass infections easily one to another and especially to their family members. A simple anti-parasitic or antibiotic (even herbal antibiotic) taken for the right length of time can wipe out the infector. Kawasaki: Boys' bodies hang on to mercury much more often than girls' bodies. Some children's livers have a more difficult time expelling the mercury. When liver can't function, swelling results. Detox the baby of mercury with cilantro and parsley juice in apple juice. Give detox epsom salt baths. I watched a baby leave hospital in a day after getting above, simple treatment. Don't make it so complicated. Doctors making lots of money at hospital can also switch over to guide people in these natural treatments, right? Don't worry, you can still make money off of sick people. Just trade your trade. I'm curious on the detox salt bath which you mention. Is it available anywhere in Singapore? good writeup! yes we should have more awareness on this disease. thanks for the post.